Today, the Modern Virtualization Appliance (MVA) vendors favor distributed storage fabric (DSF) approach. By this way, less Virtual Machines (VM’s) operating within each of its hyper-converged infrastructure (HCI) nodes act as a control virtual machine (VM) committed to storage management. As a whole, the VM’s supervise a virtualized storage pool with conventional hard drives with flash memory arrays. Within this pool, Modern Virtualization Appliances such as Nutanix, Simplivity, EMC, HP, Pivot3, and Scale Computing applies its proprietary system of redundancies and reliability checks to cut conventional RAID. The SAN and NAS have complicated storage design which requires high operation management load. Unlike this, the Hypervisor shared iSCSI (Internet Small Computer System Interface) offers a convenient means to bring more server assets into storage consolidation. 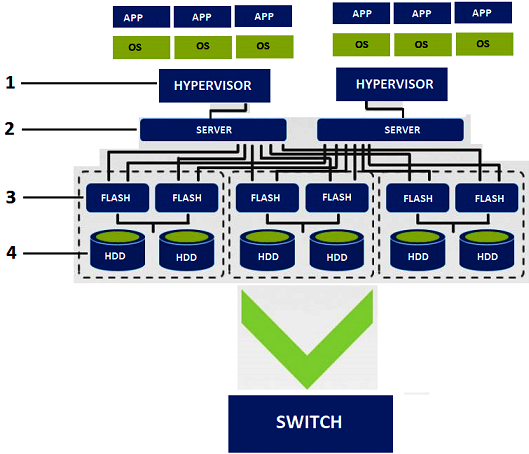 With Hypervisors, it is possible to build a virtualization environment with only servers and network switches. The Flash memory used in SSD is automatically transferred from SSD to HDD for writing data with less access frequency (cold data)and to efficiently use the storage IO. The flash memory uses SSDs in the cache tier and a capacity tier inside the servers on which VM’s run. As per access frequency, the FLASH (SSD) and HDD storages are used efficiently by migrating frequently accessed (hot data) to HDD and is automatically returned to SSD. By this approach, a software-defined data center (SDDC) is built using block-level storage to server-internal SSDs. According to company experts and testimony, running as almost 19,000 virtual machines (VMs) on just 950 physical hosts can bring high-performance with SSDs and DRAM. In addition to using their own assets, the company gains the benefits of reduced size and power needs compared to similar VM deployments that use legacy HDD. The Flash with HCI brings high computing and storage in a dominant-performing, manageable working model. The HCI and Flash will further be a critical convergence for all the enablement in a hybrid cloud model.